We supply stainless steel cemetery vases with or without inscription. Made from durable stainless steel to withstand exterior elements, our vases are available individually or in bulk orders. Suitable for all Council Cemeteries, stainless steel cemetery vases are the best option to keep flowers in water and treasured memorial sites tidy. The vase dimensions are 23cm long x 6cm diameter. The spike is 20cm long to give maximum stability in the ground. We also provide an inscription service so you can have the vase customised to suit the memorial. 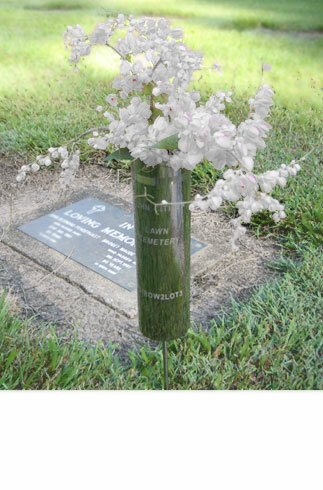 A personalised vase ensures your cemetery vase remains at the location you intend it. For example, our standard inscription includes a name and cemetery lot number - so it belongs with the memorial.